Happy Friday! As promised, I have a little treat for you. Hopefully you’ve checked out my guest post for Mood Fabrics, and yesterday’s post here on my blog with more details about my jeans. I’m so pleased with that outfit and now I get to share my joy with one lucky reader! So here’s the fun part for you: Mood has given me a $50.00 give certificate to give to one of you. Hot damn, fabric shopping time, right?! That’s $50 towards anything in their shop—fabric, notions, trims and the like. You could pick the Theory stretch denim I used for my jeans to make yourself a pair, too, or the striped cotton jersey I used for my top, or obviously anything you have your heart set on! And because they ship anywhere, the gift certificate is good worldwire, wherever it is that you happen to do your sewing on this planet. The winner will be selected at random after the giveaway closes. Please include contact information in your comment (if you’re logging in through WordPress, your email should be in there). Oh my goodness! What a fabulous giveaway! I am a definite novice when it comes to sewing, so I’ve never attempted jeans! I’d love to but some pretty floral print to make a fun, twirly skirt for summer. I have never sewn jeans but look forward to it in the future. I would probably buy some pretty cotton fabric for making a shirt. Thanks for the giveaway!! I keep hearing amazing thigs about that Theory denim – I’d love to be able to try some out! I’m afraid I haven’t sewn any jeans . . . yet! I have a pattern and a Craftsy class, so I just need some denim and mostly time now. Anyway, I’ve been having a lovely browse at the Mood site – there are too many choices! I deliberately don’t normally look at US websites due to the shipping and customs costs, but if there’s a giveaway open worldwide, then it would be rude not to! Right? I am torn between the Darjeeling Zen Garden Flowers Cotton Print and the Lemoncello Vintage-Style Tropical Cotton Woven Print. I want to make a Haiwaiian style sarong dress and I think either of these would be perfect! Yes! I’ve made jeans before. One super helpful tip I’ve learned is to hammer down supper thick seam intersections and belt loops to be able to topstitch easier! I’ve only done some really basic sewing, so I’ve never made jeans, but I’m getting better with each project! I’d spend the gift certificate on fabric to make my husband and 18 month old son matching shirts. I’ve never sewn anything with a collar before, and I’d like to add it to my skills! Maybe I would love to sew a good cotton shirt for my husband! Thank you for the chance to win! My favorite jeans tips are using a 1/4″ foot for topstitching, and using a “jeanamajig” for hammering on the button. I would love to try to sew blue jeans! But then again, Mood has some beautiful jerseys and knits, that I am starting to become confident with, using my new-to-me server! Thanks for sharing! I think I’d get a bottom weight with a little stretch. Thank you! I haven’t sewn jeans yet. I would like to get a large scale gingham or buffalo plaid for a full midi skirt. These jeans are in my project pile and your adjustments are great! I have sewn one pair of jeans and they were actually a pair of Gingers! One thing that I learned in sewing my jeans is that back pocket placement is so important in getting the most flattering look for your derriere. It’s amazing how changing the position of the pockets even by just a little (higher, lower, narrower, wider, etc.) makes such a huge difference in how the finished jeans “appear” to fit. I’m a frugal shopper, so I would buy one special fabric that I couldn’t otherwise afford. Something to make a showstopping spring dress out of. I’ve not sewn jeans before but I’m very tempted to try. So many of the bloggers I read have made the Ginger jeans and they look so great. I’m not exactly sure what I’d get at Mood. Maybe some jersey for new workout/laze around the house pants. I’ve made two pairs of Gingers and I learned two main things – top stitching is FUN, and don’t get too cocky about hammering rivets: as soon as you start thinking you are really good at it, you will mess the next one up! If I won, I’d probably end up buying some kind of loud and wild print! That, or some tasteful wool to make skirts and pants out of. I need another pair or 2…..and I’ve not used stretch denim yet. That might be fun. Ooh if I won I’d probably stock up on some nice suiting fabric for 1940s style trousers, not much of a jean person I always think I look weird in them! ? I have not sewn and probably never will as I don’t wear them, and hardly ever wear pants but never say never. My shopping spree but definitely be fabric and buttons. The tribal print fabric looks awesome. Oooo!! I REALLY need to make myself some jeans (never having done it before) since I have exactly zero that fit after two babies. Even at the same weight things just aren’t the same size they used to be ? Anyhoo, Ive been putting off buying denim since I’ve been trying to work from my stash, but a gift certificate would solve all of these problems! I have always been too intimidated to try and sew jeans, but yours look lovely, so maybe I’ll give it a try one of these days, since ready to wear jeans never fit! As far as what I would use the certificate for if I won: I would love a long full, floor length floral skirt for summer- the kind of skirt you run through fields of daisies in 🙂 The Pink/Green Whimsical Floral Viscose Poplin looks lovely. I have never made jeans, yikes! I would spend that money on… maybe a silk faille for a skirt? Those jeans are amazing, so inspiring! I’d really like to make some retro/vintage inspired pajamas for summer, out of some light cool cottons. I hammer my seams before I top stitch. I would buy some springtime colored denim! I haven’t sewn jeans yet, but if I did, they would be vintage style! Otherwise I’d just buy them. Picking one thing from Mood would be hard! I have a Marfy pattern that calls for stretch mesh, so I’d probably go for that. I’ve been sitting on that pattern for years. I saw some of their new linens though, they look so soft, it’d be great for summer! Which I’m sure will get here….eventually. I’m a little afraid to sew jeans yet. I think I need to learn a bit more before I try that. But I love the striped jersey. I have a knit class that I’d like to take, and that’d be a great fabric for a knit shirt. Oooooh what a fab giveaway! You look stunning. I love the Italian Blue/Orange Floral Printed Cotton Batiste from which I’d make a nice maxi dress for my holiday! I have not made jeans before, but funnily enough, I’ve been doing a fair amount of research on making a pair. I think I’ve settled on making the Jamie jeans by named clothing for my first pair. Yay!!!! I’ve never sewn jeans before but I’d love to give it a go. I’d love to get something that doesn’t come from JoAnn’s to sew with. I mean, I love quilting cotton as much as the next vintage girl, but I really want to try something meant for clothing! I have sewn one pair of jeans before, but they were pretty unsuccessful, so I don’t have any good tips. I think if I won the mood gift card, I would use it to buy denim for a second attempt at jeans! I have never sewn jeans before, but I loved reading the others! I probably spend it on a nice silk for a blouse. I love your whole outfit! I haven’t tried to make jeans yet but I do have the Ginger Jeans pattern so I guess I should buy some denim and get busy on that. I would also love some embroidered cotton or bamboo jersey to make some tops. Yes i’ve made 2 pairs of Gingers and am planning the next 2 pairs of jeans. If I won the gift certificate I’d walk over and get whatever grabbed my heart. I haven’t ever made jeans before. I haven’t been able to find a nice denim. This seems like a gorgeous fabric though so might be worth a try. As far as jeans go, I have only sewn one pair of Gingers so far. 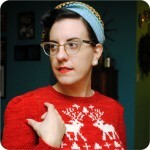 I guess my tip would be to use Heather Lou’s sew along because it helped me so much! Happy Friday! I have not made jeans before although I have some denim that I bought with that intention that’s been sitting in my stash for about two years! Seeing your Ginger jeans might be the push I need to give it a go! I have to say I’d probably spend the whole voucher on buttons! I really don’t have easy access to decent haberdashery where I am at in semi-rural New Zealand– I rely a lot on op shops (thrift stores) and the internet. At the moment it is turning chilly here so I’m sewing myself an unlined 49er style wool jacket– some ritzy buttons would be just the go and I have about three other projects waiting for buttons too! So buttons would be great!! I have not, in fact, sewn jeans before. I get too caught up in novelty prints to make any basics. I would buy some plain gray wool coating so I can finally get started on my Cascade coat before winter rolls around again. I’d buy some nice shirting for a new dress shirt. I’ve had the Ginger jeans in my queue for a while, hopefully I’ll give it a go sooner rather than later. I’d probably use the gift card to go towards some 4-ply silk for my wedding dress. I have attempted jeans but they were not satisfactory. I’ve delayed a second attempt, but lately have been giving a second pair a try. If I were to win, I would purchase lightweight denim because I actually want to make a shirted dress. Thanks for the giveaway! I would probably use the gift card for some really wild and fun fabric! I definitely want to try sewing jeans! I’d probably buy jeans fixings! I just finished my first pair of jeans. Now that I have a reference for how the Gingers fit me, my next pair I’ll be using notes from your post yesterday to raise the waist! My tip is to use a washable glue stick wherever it seems it will be useful – particularly helpful for things like flat-felled seams! I also know that I would buy some wool jersey if I got a Mood gift card. I have not sewn jeans before, but I would probably spend the gift certificate on some jean fabric as I’ve been itching to try out the Ginger Jeans pattern! I’d buy some silk velvet for a lovely Deco style dress. Most of my sewing projects are very practical, so I’d splurge on something not so practical! I’d get fabric for a cloak! It’s coming into winter here and I’ve just moved from the tropics to a much colder climate. I would definitely buy some warm fabric and make outer wear or underwear from it, as I’m currently woefully unprepared for the cold. I need to make things to help keep me warm! I have made jeggings but not jeans. I have the ginger pattern but haven’t been brave enough to sew ityet. I am on a dress tangent right now so I would probably buy a spectacular vintage print. Hi, I’ve never sewn jeans before. I’ve been gathering tips and looking for the right pattern for me. I would probably get some denim, or maybe a knit to make a cute top. :). What an awesome prize! I have yet to sew jeans, but they are on my list for this year 🙂 I’m excited to hear any tips you get. I’m not entirely sure what I’d get at Mood with the prize because I love too many things! I adore the floral twill that Mary of Idle Fancy used on a shirt dress recently, so maybe that, but maybe something even more spectacular once I look around 🙂 Thanks for the awesome giveaway and the tips on making retro jeans! I have a pair of ginger jeans in the works but fit issues have them in time out for awhile. I just finished sewing my first pair of jeans (actually, overalls) that had RTW features like topstitching and such. I learned that a denim needle DOES make a difference in topstitching (versus just a larger sized needle that comes in the universal packs). I have some gorgeous pewter buttons that I have been dying to use. Mood has a silk twill in a color called bluestone that would be just perfect to pair with it and make a shirt dress. I’ve been wanting to make a jacket I can wear to work, like http://www.burdastyle.com/pattern_store/patterns/crossover-blazer-062012 which I just discovered. I’ve made two pairs of jeans and the best tricks I know is, if you want a double line of topstitching, to stitch the first seam at the regular seam allowance with wrong sides together, and to use your topstitching thread and see right side up. That way you can lay down one line of topstitching and just sew the seam twice. I haven’t sewn jeans before but I’m thinking about trying, so I can have a perfect pair (high waisted straight leg). I would love to find some lightweight linen or cotton from Mood for a great vintage shirt pattern I just found! i haven’t worn pants in years, so I’ll pass on that part. What I need is a lovely summer weight jersey for a swingy summer dress. And thank you to Mood and Tasha! I’ve never sewn jeans but I’ve got the ginger pattern and am trying to build the courage to try it out. If I won it might be the push to invest in some quality denim, or if I’m still too scared some striped knit, to replace my worn out summer tops. I haven’t made jeans, I’d class myself as an improving beginner and until recently jeans seemed way outside my skill set! I do love your high waisted pair so much though, and having seen a shirt recently feel like it I took it really sloooowly I might just be ok. On that basis I’d love some of the denim you used for your jeans. Oh, sewing jeas is still in my to sew list… But in the meanwhile I would like to make the Sutton blouse with the gorges Dusk Mauve China Silk/Habotai from Mood! Oh wow! I love these jeans so much. I’ve bought the pattern but not got any fabric for them yet, so I think that’s what I’d probably use a gift certificate for if I was lucky enough to win ? I’ve just sewn my first pair of gingers, fit is great except for the waistband been too loose. So its back to the drawing board for me. I would buy some stretch denim if I won the giveaway. I would spend it on denim because finding decent denim in Australia is very hard! Yes I’ve made a pair of jeans and LOVED the fit! I’m excited to make another pair! My advice would be to choose your sizing based on the amount of stretch (or lack thereof) of your denim. I’d make another pair. I’m too nervous to sew jeans yet! I just started sewing a few months ago so I’m taking it slow with (slightly) easier projects. I would probably get a fabric to make a lightweight spring jacket! Those are fantastic jeans! I want to sew those!!! I have only sewn “faux” jeans, ala the Gertie capri pants with denim and topstitching. Rivets scare me, but hey, there’s a first time for everything! I’ve made 3 pairs of jeans. The most important tip is to be patient. Sewing fast on heavy denim is a good way to break needles. I love Mood! I go every time I visit NYC. I would probably buy some stretch sateen. although i haven’t made jeans before, i am totally inspired by your post(s), especially because the process seems pretty daunting to me. the way you describe your adventures in jeans-sewing has almost convinced me i should try to make at least one pair. in terms of fabric purchases…well, i’d love to make a 1940s/50s summer dress, as well as a petticoat to go with it! and maybe i’d have enough to buy the fabric for the jeans as well! No, I have never sewn jeans from the beginning. I have shortened and hemmed, patched and repaired plenty. That is a horrible job. I want to try and would probably buy denim for a pair like yours since there are so many jean tutorials now. Thank you for this great contest and I hope to win. I’ve never made jeans but I never wear jeans. I never wear pants actually even during polar vortex. I once took a sewing class where the instructor had us meticulously fit a pants pattern. Of course none of us had any plans to ever use that pattern again since she picked PLEATED pants. Hello 1980’s, goodbye 1980’s. I usually buy novelty cotton but if I had that gift card I’d probably get something a little more special. I have never sewn jeans but I would really like to give them a try. 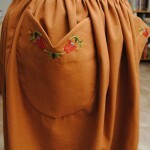 A tip that I like is extending the pocket lining to the front fly- apparently it acts sort of like a built-in tummy tuck. If I win, I would like to get some kind of lovely summery fabric for a dress to wear this summer! I´ve made jeans! And the best tip would be. Dont be affraid! Just do it – cut that denim and sew those jeans! Love your site! I have made jeans, but I’d like to try. I would have no idea what I would buy but it would be fun to spend it !!! I have made one pair of jeans for myself and I learned that it was worth it to make a muslin before hand. I had quite a few adjustments to make and although it took some time to get to actually making the jean because of the alterations made, it was worth it. I would probably purchase the stretch denim you chose. I haven’t tackled jeans yet, although I have the ginger jeans pattern and some denim sitting in my stash. Just need to work up the nerve! I think I would use the $50 towards some really nice knits. It’s so hard to find knits locally where I live. Wow! Thanks for the opportunity! I haven’t made “real” jeans yet, so I don’t have much to say on that. If I was lucky enough to win, I would probably buy some cotton eyelet or and embroidered cotton for a sundress as its getting warm here in CA already! I’ve never made jeans before, but I’ve had a pair of capri’s using Butterick’s B5895 on the backburner for about a year. Lately I’ve been completely hoodie and cardigan obsessed, so if I ever got a gift card to mood I could definitely see myself buying some nice thin french terry or a breathable Florida friendly interlock with it! I’d like to make a nice dress for summer from the mood fabric. 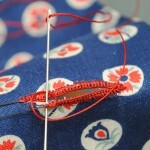 Topstitching with thicker thread really looks better when seen at a slower speed. Put regular thread in your bobbin and look at all your feet to see what will help you sew a line a consistent distance from a seam. This is especially important with contrast thread as any wonkiness will glaringly stare back at you every time you look at it. Also no stretch denim is the same so don’t get cocky about how your last pair fit – baste every single time. I like the Turkish Black Novelty Polyester Sheer. Beautiful jeans. I’ve only made a jumpsuit, loosely fitted, jeans seem like so much work! I really like watching your sewing journey, and loooooove your construction posts. It makes me feel like I can do it too! I’d definitely put the gift card toward a liberty print silk cotton voile. I’ve never made proper jeans before, but if I had a choice of fabrics I would get some good bamboo or cotton jersey. Since my Joann’s seems to never have what I need to make everyday pieces. Good knits are harder to come by. I just made my first pair of jeans (the Jalie pattern). I adore them! And now I want to make about 12 more pairs. Anyway, my tip for first-time jeans sewists is to buy more top-stitching thread than you think you’ll need. I would have had enough, except for some stuff I had to un-pick, which meant I didn’t actually have enough. Not having time to run to the store, I did the hems in regular navy thread. I would probably spend the gift certificate on more denim. As I said, now I want to make ALL the jeans! I haven’t made jeans yet, but I bought a pattern last year. So, if I won, I’d probably have to take that as a sign from the universe to get to it! I sewed jeans years ago when patterns fit me without adjustments. I don’t have any tips about sewing jeans. Just in general, cut carefully, don’t be afraid to use your seam ripper and hand basting is a good thing. I might very well choose some stretch denim to make jeans, but I’d make them for my grand daughters. They’re nearly 3 and nearly 5! I have never attempted anything more than dresses and skirts so far, so I think jeans would be a bit much for my skill set! After reading the comments, I don’t feel as bad about not sewing jeans before. I would still probably buy the Theory stretch denim though. Since I practically live in jeans, it high time I attempted sewing them. I’ve been terrorized at the thought of rivets, but I love the top-stitching you’ve done in lieu of using them. Great job on those jeans; the fit is amazing. I have just finished toile-in uo my my first pair of jeans….self drafted, yikes! The fabric I would buy would be for a winter coat….if I start now it night be ready for next winter, right!? I have never made jeans before but have been following everyone’s comments and ideas because they are certainly on my to-do list. Maybe I would finally get a pair of jeans that fit me. ah, i haven’t sewn jeans, yet; although, they are on the mental list. As for Mood, i tend to gravitate to their wools- so many beautiful choices. Thanks! Please consider me for the giveaway!! From past experiences I know Mood has too many options for me to walk in with a plan. This past winter I walked in there wanting to get a brocade to make a killer mini skirt and ended up with some fantastic striped terry. So, if I won maybe I would try to get that brocade again?? I have never sewn jeans or pants as a matter of facts! I’m on a circle skirt sewing spree and I’ve dreaming about a 2cm black gingham one. So that’s probably what i would spend the 50 on. Thanks for the giveaway! This is a fantatic givewaway! I’ve been sewing for several years now but I’ve never attempted jeans. I’ve been wanting to attempt them for a while now and have been on the lookout for the perfect denim to use! If I win, I would spend the gift certificate on denim to make my jeans! I have a bunch of stretch burgundy denim all cut and ready for my first go at sewing jeans but I’m SO sure I’m going to need ALL the tips and tricks! If I had the gift certificate I would buy something floaty and pastel for a maxi skirt! This is a wonderful giveaway! I am loving the jeans and the top! Great tips on the alterations to the jeans you made as well. What would I buy??? I would put the money towards some Liberty Cotton Lawn. For either a top or a dress. I know $50 won’t get me far with that but it will get me some. Either that or some lovely floral cotton knit fabric I have been stalking there for a while. Thanks for the chance at this wonderful giveaway! Gingers are next on my list. Yours by the way are fantastic/ love’em! Needless to say, denim will be my purchase. I want to make a pair of black denim Ginger jeans with black topstitching- no contrast. One less “fussy” step, but I think the look will be exactly what I’m going for. Thank you for entering me in the giveaway!? I think I’d head for some lingerie supplies – I’m keen to start making my own! I’ve never sewn jeans, but I think I have enough challenging things for now. Fabulous jeans! I’ve never sewn jeans before, although that does give me a tip to share: procrastination is the worst enemy of finished projects! I have the pattern, the fabric, the notions, but I keep putting off printing and assembling the pattern, so jeans remain unmade. 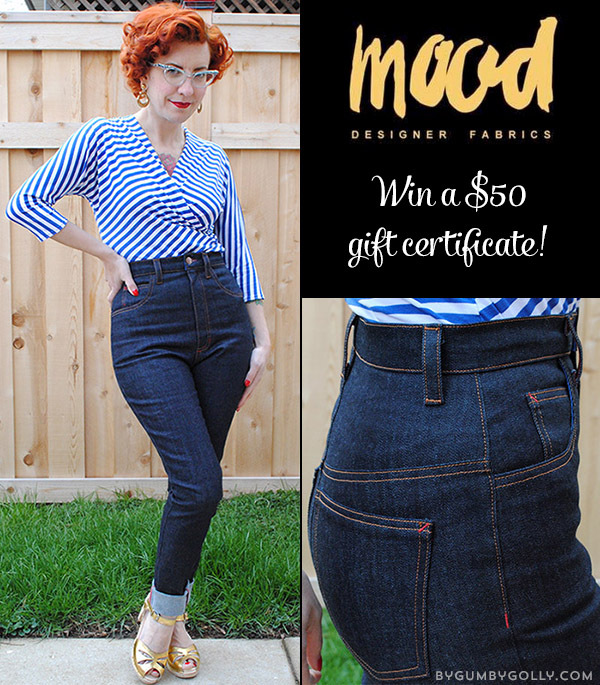 I’ve never sewn jeans before, but I if I won the $50 from Mood, it’d probably be on denim! Either that, or a heavier weight fabric for a jacket. I’ve sewn the ginger jeans 1 time before and although I knew I had to use quality jeans fabric instead I made it up in low quality fabric. I told myself it was some sort of muslin (hopefully a wearable muslin) Off course it did not turn out that way. The fabric stretched out immediately with made fitting a disaster. It is now on top of my UFO pile because I can’t bear the thought of trowing it away since it took me so much time to make it. Aaahh… another lesson learned. Thank you for the giveaway! I love your style! Oh my a Mood GC! I would go nuts when I get there next fall! Probably some stretch denim for the Jalie Eleonore jeans I’m going to try! I love your whole outfit! I’ve never sewn jeans before, but that’s one of my main goals for this year since I cannot seem to find any in the stores that have a high enough waistband for me. I’m eager to try the Ginger pattern since I want more of a retro look! If I won the gift certificate, I would probably either get the Theory denim or the Italian Cerise and White Cotton Blend Jersey for a knit top. I’d like to get some lawn to make a nice summer dress! I have sewn jeans before, but I don’t know if I have any tips yet! I did use a nice topstitching thread though, and I think that made a difference. I might buy some more stretch denim. I actually want to make some pull-on jeans using the new Jalie pattern. Capri length for summer! They are gorgeous jeans! I would be very tempted to go for the stretch denim myself. I’m currently attempting to fit a muslin for a pair of cigarette pants – after I have that sorted it’s on to jeans! So far I have learnt my bum is an odd shape. . .
Love your retro jeans! I have sewn a couple of jeans by now and have created my own way of sewing flat felled seams that saves time by not having to switch thread all the time. I am hoping to post a tutorial on this some time in the future. If I were to win I would buy fabric for the summer, dresses, shorts, tops. I love sewing summer things but rarely have time to finish all my planned projects. I haven’t sewn jeans “from scratch” but have made many repairs/alterations over the years. May I say, yours are so very inspiring! If I won a gift certificate I think I’d try the Theory stretch denim for a slim profile skirt. After losing ~23 pounds in the last year, my clothes are not very flattering and I really need to sew to get the fit I have in mind. Love your blog so much. I’ve sewn pants before, but no jeans…. I think I would end up buying some wool for my tailoring class in uni. Mmm…that website is dangerous. I’m afraid it’s going to be “Hot damn-fabric shopping time!” whether I win your giveaway or not. I haven’t made jeans (yet), for I am mostly a skirted creature. But I am experimenting with lingerie, so if I had $50 to spend at Mood Fabrics, I’d probably get a selection of china silk, for the most luxurious of underthings. Something about wearing bespoke silk tap pants beneath my thrift store dresses seems delightful. i would like to try a landscape print in a cotton to try and make a dress from! Thanks! I would buy fabric! Of course. I love rayon for summer dresses. Thank you! I’ve never sewn jeans before, but am becoming tempted by all the great things people have said about the Ginger jeans pattern. With a Mood gift certificate, I’d buy fabric for some fun blouses to wear to work. Thank you for the opportunity! I have never sewed a pair of jeans but I do have hopes of sewing a pair of denim shorts this summer. I would choose a nice, stable knit to create a dress from. I am sewing to fit my new size and am still working through creating a basic wardrobe. It has been a fun journey teaching myself to sew. I’ve never sewn a pair of jeans, but I only wear pants about 5 times a year so they are not a high priority for me! With a Mood gift certificate, I would buy some beautiful tropical printed lace I’ve been eyeing. Wow, $50! I’d get some Liberty of London for a luxurious summer nightie. I see some prints and colorways there that I don’t usually see! Wow, thank you for hosting this giveaway. I’m not 100% sure what I’d get if I won. I’m in a little bit of a sewing rut because I’ve changed sizes since I last worked on wearable project and now I have 3 half-done WIPs that I won’t even be able to fit in if I finish them. Maybe it is time to start fresh! From making a few pairs of pants including jeans, I’ve learned two things. 1) make sure the pockets are big enough for whatever you normally like to carry around with you. 2) if you want two lines of top stitching on a flat felled seam, see the fabric right sides together with topstitching thread on the top and regular thread in the bottom. Then when you flat fell you lay down the second line. Learned that from Peter Lappin’s (male pattern boldness) sew along. As for fabric, I’m hoping to sew a light jacket and some shirts for summer, so I’d love to get some linen. I’ve had the best stitching results by switching to a dedicated topstitching needle for sewing jeans. It worked better than the jeans needle. And I’d pick a pretty mood fabric to sew the shirtdress pattern that’s been sitting in my to-sew list!!! You’re rocking those gingers! Double gauze! Fo sho. I want to try it! I have not swen jeans before but gingers are in my queue. I have fabric and notions, just need to jump in. If I win the gift card, I definitely buy some wool crepe. I have been lusting after some for awhile. Thanks for the giveaway! Love the top! Your jeans turned out so great! I have not attempted any type of pants yet. But I know exactly what I would buy from Mood Fabrics. I have a great Vogue pattern from around 1942-1945 for a battle jacket. I have a lot of cute dresses and cardigans, but no coats or jackets that match my vintage clothes. So I want to make a lightweight wool flannel battle jacket, with a lining. No jeans and no plans for them! Hmm, I don’t see that Mood sells the gift of time to do more sewing, so I think I’d have to go with some amazing outdoor fabric for my front porch bench cushion. Never sewn jeans before and not sure I would since my Freddies fit so well. I’d like to find some good rayon for 40s era dresses and play suits. I’ve never made jeans, but should I have a mood gift certificate I would definitely spend it on some merino wool jersey. Swoon!! Hi Tasha! Great job on your jeans. What an amazing fit you got! I’ve sewn a pair of jeans before and I learned that pattern alterations, basting, and fit-as-you-go are the hardest parts of jean making. Doing the ACTUAL sewing is a snap. The seams are long and somewhat straight so the sewing is surprisingly quick. So once you manage the hard fitting part with a jean pattern, the rest comes easy. The first pair of jeans I made were from a vintage McCall’s pattern, actually, they were shorts. As I have transitioned to wearing almost entirely me-made clothing I found I had no summer shorts and they were my first try! Wide-leg, culotte-y, side zip and I LOVE THEM SO MUCH! I felt amusingly scandalous getting in and out of the car in them. I nearly always wear dresses and having my legs in so much open air made me giddy. I can’t wait for the warm weather to come back so I can rock them again! I still haven’t made jeans, but I’m eyeing Closet Case Files’ new release and desperately wanting a pair! I’d love to get some denim at Mood and maybe some linen for summer sewing. Oh dear, I still haven’t made jeans. Body is in flux at the moment and I just can’t bring myself to invest all that time and effort into something that probably won’t fit six months from now. My word though, your Gingers are inspiring! I think I’d have to go for some Denim so that when I do gather up the courage to make a pair of jeans I have some fabulous fabric to make them with! I love the colour purple so I’d go crazy with adding purple bar tacks as it’s a really cute detail and doesn’t involve me hammering holes into something that I suspect will take a while to construct! Failing that it’d be something from their lace selection or an amazing oversized tropical print for my dream summer maxi-skirt! I have never sewn jeans, but it’s something I would really like to try. I just ordered the ginger pattern. I’ve only recently started sewing for me, so I haven’t made jeans yet. Yours look truly awesome! I haven’t sewn jeans yet, although I plan to, so no tip to share. I’ve been checking Mood’s online store, they have so many lovelies, it’s hard to pick a favorite. I think I’d get something that I have a hard time finding near me. Some things of interest: wool gauze, linen jersey, some ponte to make a skirt… Or I may get yet another corduroy fabric, as I’ve seen one with a crazy 70’s inspired print that I loved and another with autumn colored stripes. Thank you and Mood for this giveaway! I would say – when sewing with denim- go slow. Getting the fit can be a challenge. You have mastered the fit part though. I would use the 50.00 to buy some denim to make my “morgan’s” and some double gauze to make the hot patterns metro urban gypsy blouse. I think those 2 would make a great look. First off, your sewing and knitting inspire me to no end. Love your blog! For me, baste first, crotch depth is the key in sewing pants and in peticular, jeans. Great giveaway, good luck to all!! I attempted jeans once in a drafting pattern class I took in school. Alas they did not turn out because I sewed from the bottom up, always always sew top to bottom on jean inseams! If I win, I’d like to buy some of the denim to try making jeans again and maybe some knit fabric too as I finally purchased an overlock machine. I was all set to try making jeans, and then I got pregnant – so much for those sewing plans! So instead I’ve spent the last eight months sewing nothing but stretchy, swingy maternity shorts, and as a result I am SO sick of sewing with knits. Ugh. $50 to Mood would go towards some sweet cotton voile for a little Juliette blouse to go with the Ginger jean shorts I’m prepping! Jeans are a bit too ambitious for me at the moment. I think I’d buy some striped Jersey. So many gorgeous hand made t-shirts at the moment online. I definitely want to try making one myself in the near future. I’m not saying this to butter you up because I never win anything but, dude, I would totally make your outfit. I love love love that top with the jeans. I’m about to make Eleanore elastic waist jeans as a way to dip into sewing with jean-type denim. I need some luck and courage before embarking on “real” jeans. Well, your jeans look so fab I might have to buy some stretch denim myself. I’m thinking more of a wide-legged, sailor pant style. Wow, thanks for the giveaway! I just finished my first pair of Gingers, and the zipper broke on me the first time I wore them… so I guess I learned to make sure I use a tough enough zipper! They were also a little snug because I finished sewing them almost a year after I started them, after changing size, so that was probably part of it. With the gift card, I’d very possibly buy some denim! Or I might look for some lightweight linen for making a summery button-down shirt. I’ve made Ginger jeans — low rise – an they are my favorite. I used a mid weight stretchy black denim with purple top stitching. I got a pretty darn good fit with just a few tweaks to accommodate my junk in the trunk and eliminate the waist gap. Those are my fave jeans and I should really make another pair. When I go to Mood I just wander around touching things. I am always drawn to their wool section since there are so many gorgeous embellished ones, but live in California and have few wool needs. I would probably buy some merino knit fabric since the last piece I bought was amazing to sew up.